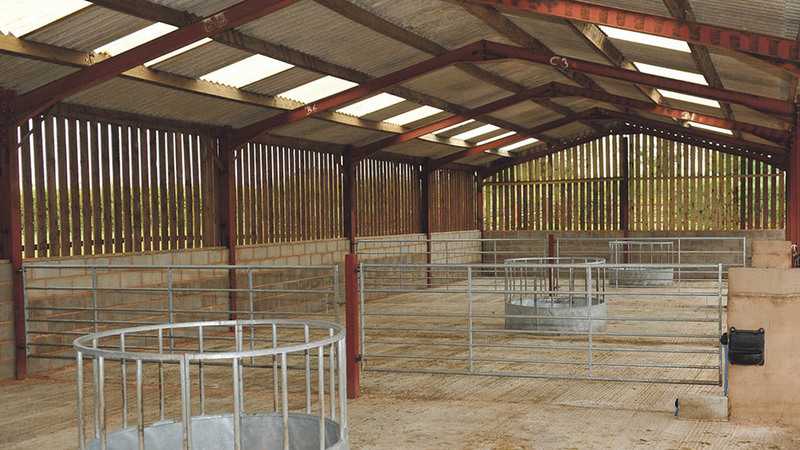 Improving farm building design increases the well-being of livestock and RIDBA technical consultant, Dr Martin Heywood, looks into some of the key areas that should be addressed by farmers to improve the health of their livestock. It is essential animal housing provides a comfortable, clean and dry environment, free from hazards and health risks. The design of the building and specification of the materials used to construct it play a major role in achieving these aims and, if done properly, can lead to healthier, happier and more productive animals. The provision of adequate ventilation is arguably the most important consideration when designing a new building for animal housing. A distinction needs to be made between a well ventilated building and a draughty one. Nobody, human or animal, wants to live in a draughty building that lets in cold air whenever the wind blows, causing discomfort and potentially ill health. On the other hand, a regular supply of fresh air is essential to replenish oxygen, remove exhaled carbon dioxide and control temperature and humidity. Correct ventilation will reduce relative humidity and the risk of respiratory infections, eliminate stagnant air and avoid unwanted draughts. Factors to consider when designing a building for ventilation include the dimensions of the building and layout of any internal partitions; the proposed occupancy of the building and factors affecting the local wind speed, including building location, altitude, shelter and proximity of other buildings. Even at fairly modest wind speeds, the ventilation of a typical livestock building will be governed by the wind effect, meaning sufficient fresh air will be supplied naturally by the wind. But a building containing livestock must, however, be adequately ventilated even on the calmest of days, relying on what is known as the stack effect (warm air rising replaced by cooler air). The adequacy of stack effect ventilation for a given building will depend on the location and size of the inlets, the location and size of the outlet vents and the heat generated by the livestock. Farmers or building contractors need to calculate stack effect ventilation and there are guides available online. Condensation occurs on a surface when the temperature falls below the dew point for a given relative humidity. Condensation does not cause high humidity, but may be a symptom of it if the temperature is low enough. Although condensation can be a nuisance if it results in dripping water, it is high humidity – for example moisture in the air - that causes health problems in livestock. The focus for the building design should, therefore, be on reducing humidity through good ventilation rather than hiding the problem through the use of absorbent materials. Buildings used for housing livestock should have adequate levels of lighting, provided by natural or artificial means, or a combination of the two. Natural daylight is normally provided by in-plane rooflights, often arranged in bands along the roof. Since rooflights allow direct sunlight to enter the building, there is a risk of overheating in summer if the percentage area of rooflights is too great. It may be possible to use a smaller area, and therefore reduce the overheating risk, by specifying cladding with a highly reflective coating on the inside. Surface finishes should be smooth and without sharp projections to avoid injury to animals or people. Walls should have a washable inner surface that can easily be hosed down and floors must be non-slip. With careful consideration at the design stage, it is possible to create a healthy and pleasant environment, with adequate fresh air, and lighting, humidity and temperature levels that are comfortable for the animals. Good ventilation and careful specification of materials are the most important factors.